‘The community we were creating’ | What happens now? This week we hear from Danielle Hark, the founder of Broken Light Collective, the online photo gallery for people living with or affected by mental illness. She created the project at a time when she was going through severe depression, and as the site now explains, “it helped her get out of bed and begin to engage with the world again.” The site now has more than 10,000 followers. You say you started to be open about your experience in just the past few years. What made you decide to go for it? I started the online gallery anonymously on March 1, 2012, Self-Harm Awareness Day. I wanted the site to be about the contributors and the community we were creating of people affected by mental illness, not about me personally, so I made a conscious decision not to include my name or journey. I also was scared at first to share my struggles, as I always had been in the past, because I feared how people would react and worried about losing friends or my job. I started telling my story anonymously through the site and was encouraged by the wonderfully supportive feedback I received. The more I shared, the more “normal” it began to feel to be open about my experiences. As the Collective grew, I began to feel that I was being hypocritical because I was encouraging others to be open and not being open myself. I had the opportunity to do a few television and radio interviews, and that was where my anonymity ended. I knew I had to be myself, and my mental health challenges are a part of myself. They are not all of me, but they have been a part of my journey, and my journey has created who I am and led me to this point in my life. I began writing wellness articles for The Huffington Post, Dr. Oz’s YouBeauty and Beliefnet to encourage people in difficult places. My story came out in bits and pieces through the interviews and articles, and I quickly realized how many people could relate and hopefully benefit from my openness. I’ve “come out,” so to speak, a little at a time since then. I have taken it slowly for various reasons, including the fact that I have experienced stigma in the past, and since I have a young daughter. I think it is important to question how the decisions I make will affect her. I have come to realize, though, that being open is setting a positive example for my daughter in the long run. I am proud of the person I have become, and must accept the ups and downs that have led me to this point. Yes, I have been to the deepest depths of depression, but thankfully that was not the end of my story. I accepted professional help and used various tools, including photography, to fight my way back. If telling my story gives hope to others who are suffering and helps even one other person to seek out help or use creativity when they feel impulses to do something harmful to themselves, then it’s all worth it. You’ve spoken about openness and the need to find communities to talk about these things. Is it still somehow harder to bring up suicidal thinking, and why? Suicidal thoughts are a defining characteristic of mental illness, and unfortunately there is stigma and fear surrounding psychiatric illnesses and treatment. Many people base their information on movies or media portrayals that paint scary, violent pictures. Hopefully by talking about the realities of mental illness more, both the suffering and the recovery that can be attained, we can reduce the fear and stigma around suicidal thoughts and all issues of mental health. A good first step to opening up is being involved in a community with people who can empathize, whether that is through something like Broken Light Collective or a support group. These environments create safe spaces where we can begin to share and open those dialogues that feel so taboo while feeling supported by others who understand and will not judge. Have you ever come across an image on your site that struck you as capturing the idea of suicidal thinking especially well? I am struck over and over again by the beautiful ways in which people convey their struggles visually. Many contributors to Broken Light Collective have experienced suicidal thinking, and I think it comes across in the art … In the visual play between darkness and light, the images of things that are broken and abandoned, as well as conceptual self-portraits of people trapped and melancholy. There’s not one image that captures suicidal thinking, there are countless, all conveying the same feelings in different ways. I think that is part of the beauty of the site. Everyone’s experience with mental health challenges is different, but there are common threads throughout creating almost a shared experience of our individual struggles. It sounds contradictory, but it’s true. People have shared that when they are at their lowest, they know that they can view the images on the site and instantly feel connected and not alone, even when they are isolated and thinking that no one else could possibly relate to their depths. How do you respond if someone reaches out to you for help through your site? As we state on the website, taking and viewing photos does not replace professional help, and people should seek help immediately whenever their thoughts are unmanageable. Broken Light Collective does have a mental health advisor, Laura Alper, a clinical social worker in practice for over 30 years, but the site is run by mental health sufferers and advocates and therefore does not offer psychiatric advice. We often encourage people to see doctors for assessment and treatment, or if they are in crisis to go to an emergency room or call a crisis helpline. Photography is an incredibly helpful tool that can aid in recovery. It can help people express themselves and be present instead of lost in negative thinking, but it should be used along with doctors, therapy and medication as needed. There are professionals trained to help us on our paths to recovery when we need it, and there is no shame in reaching out. I’m so glad you agreed to be interviewed!! 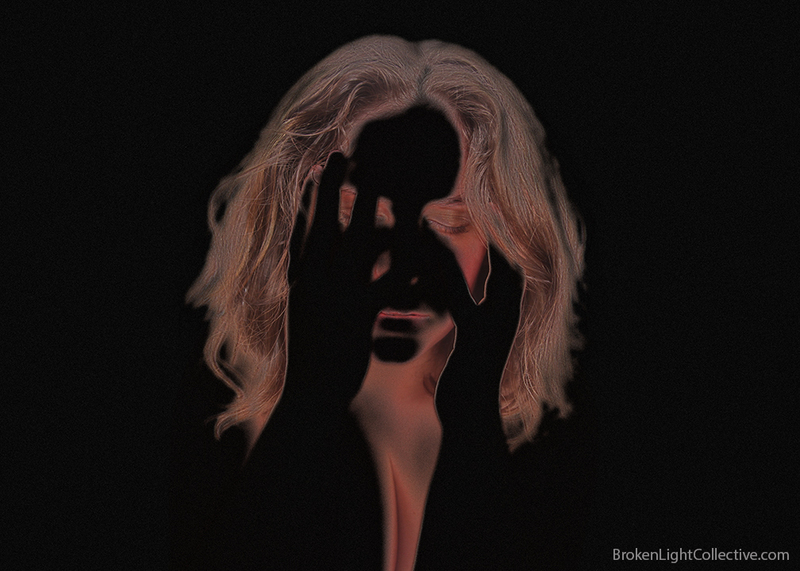 The Broken Light Collective is an incredible and much needed project…there is not one photograph that doesn’t illicit compassion, sadness, joy, understanding…having lived with major depression for two decades amd being an attempt survivor myself, I see myself in many of the individuals. Thank you for creating the collective and sharing your story! When I read your blog I remembered the feeling of being locked into depression. The blackness was organic for me, like an appendage that was wrapped around my heart and mind. I had forgotten how it felt to be trapped in a feeling that was sheer hell. So much pain and no way out. Not even a crack of light. Just doing things by rote (I kept a written schedule of things to do during the day marked by the hour- 9-10 am house cleaning; 10-10:45 practice the piano; 10:46 to 11:00 read ………etc. to keep me moving during the day). I just followed the pre-planned schedule. And eventually there were chinks of light. Now I deal with clouds that come and go in the breeze. I’m so glad I stuck it out. Thank you for your story.